4982 ✉ W4b St. Andrews cross - 10 Pfg. 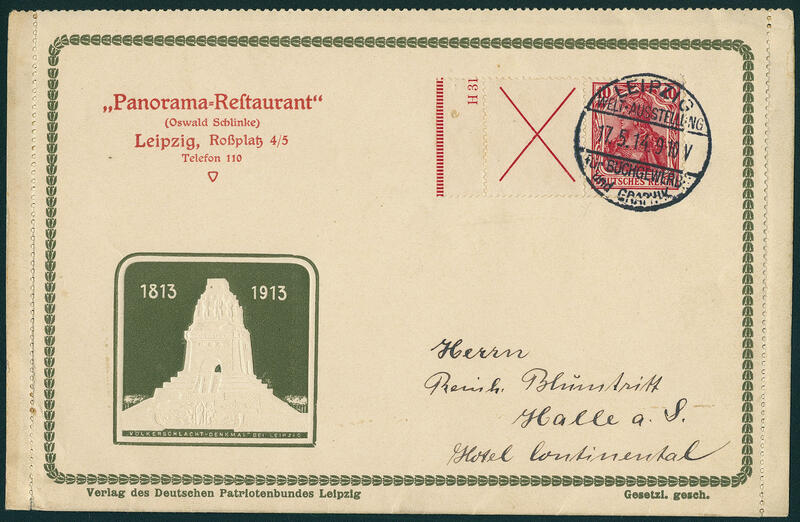 Germania, horizontal se-tenant with booklet sheet margin and part the house order number, fresh colors and in perfect condition on very nice stamped advertising letter \"PANORAMA-RESTAURANT LEIPZIG\" with special cancellation \"LEIPZIG world exhibition for book trade and graphics 17.5.14\" to Halle. An exceptional nice and rare cover! 4983 ✉ W4b St. Andrews cross - 10 Pfg. - 10 Pfg. 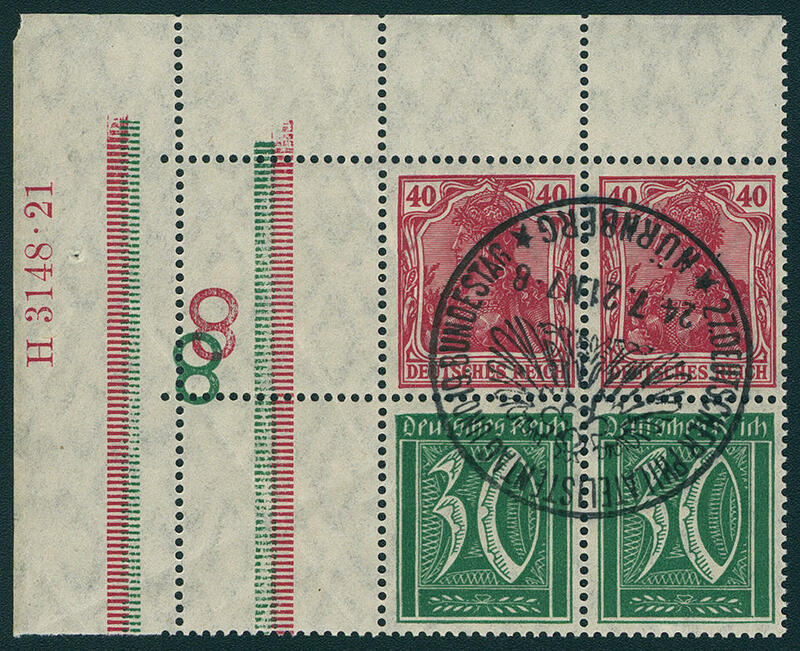 Germania, horizontal se-tenant with booklet sheet margin as additional franking on postal stationery letter-card 40 Pfg. 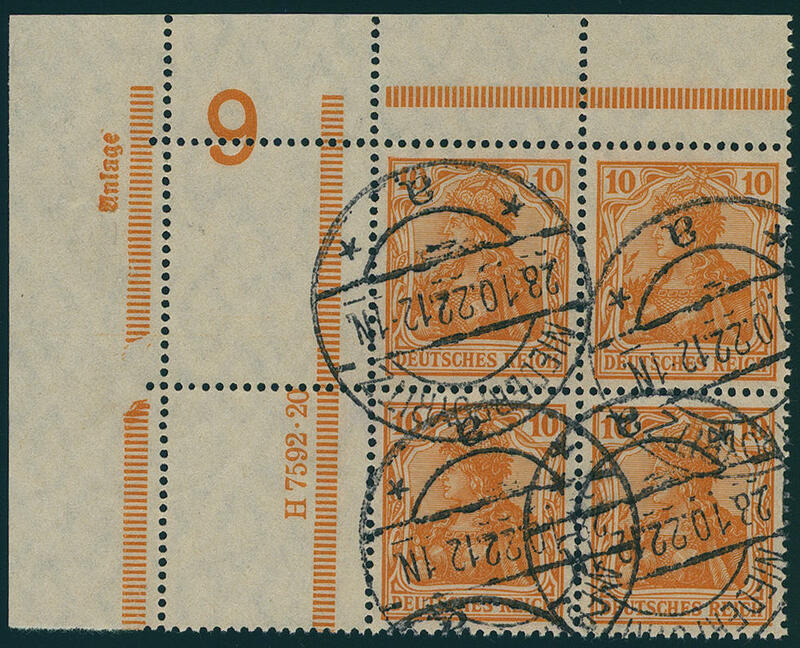 With neat postmark \"Wroclaw 5.6.21. \" to Guchau. A gorgeous and rare document! Expertized Weinbuch BPP. 4984 K3F 40 Pfg. 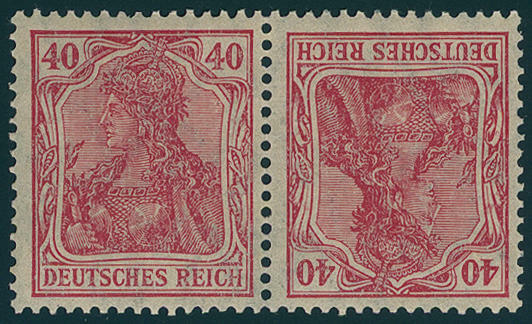 Red (porous printing), horizontal tête-bêche pair, fresh colors and very well perforated, in perfect condition mint never hinged, expertized Oechsner BPP. Michel 500,- €. 4985 ⊙ RL1.1DZ/HAN Border bar blank field - 10 Pfg. - 10 Pfg. Germania, horizontal se-tenant twice vertical se-tenant from the left upper corner, the upper se-tenant with printer sign \"attachment and numeral 9\", the lower se-tenant with house order number \"H7592.20\", fresh colors and very well perforated, unfolded and neat cancelled \"NIEDERPOYRITZ 28.10.22. \". By Michel catalogue is this se-tenant neither with the printer sign, still with the house order number indicates. In this kind a spectacular unit for the sophisticated special collection! Photo expertize \"genuine and entirely perfect\" Weinbuch BPP. 4986 ⊙ RL11/12HAN Border bar - 40 Pfg. - 40 Pfg. And border bar - 30 Pfg. 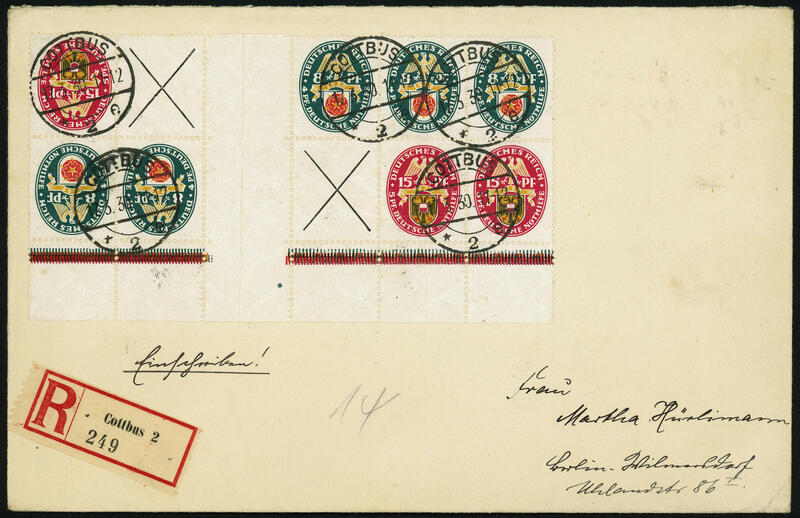 - 30 Pfg., two scarce se-tenants se-tenant from the left upper corner with house order number \"H3148.21\", fresh colors and very well perforated in perfect condition with centered special cancel \"Nuremberg 27. German philatelists day and Lower House of German Parliament 24.7.21. \". Already the normal se-tenants become genuine used at rare intervals offered. Associated with the house order number in the Michel special catalogue unlisted and from utmost rarity! Photo expertize \"faultless condition\" Bechtold BPP. 4987 W22 15 Pfg. 10 Pfg. 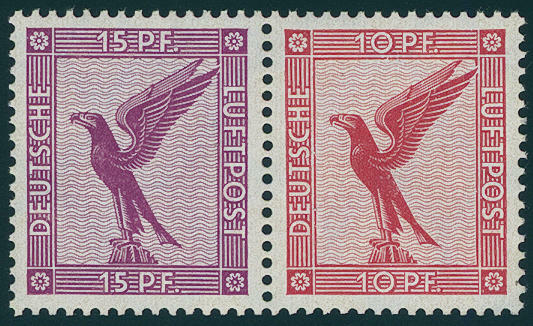 Airmail 1930, horizontal se-tenant, fresh colors and very well perforated, in perfect condition mint never hinged without any signs. Michel 200,- €. 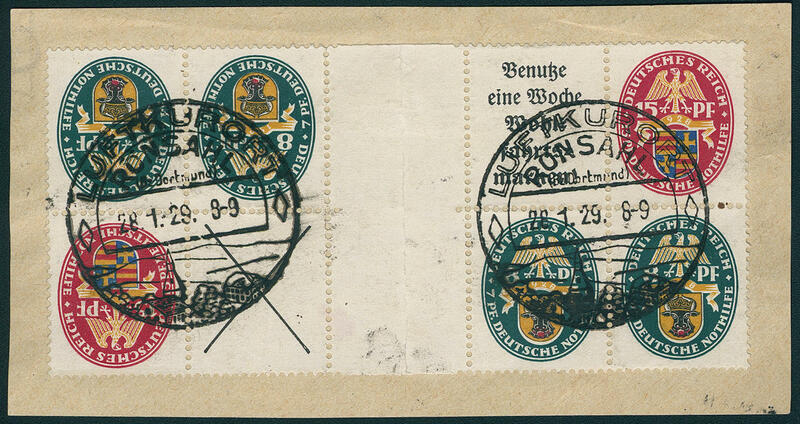 4988 ✉ W24.1 Help in need 1926, St. Andrews cross - 10 Pfg., horizontal se-tenant, fresh colors and in perfect condition on correctly franked cover from \"DÜSSELDORF 21.1.27\" to Dortmund. Michel 800,- €. 4989 ∆ KZ11/12 Help in need 1928, The Persuaders! 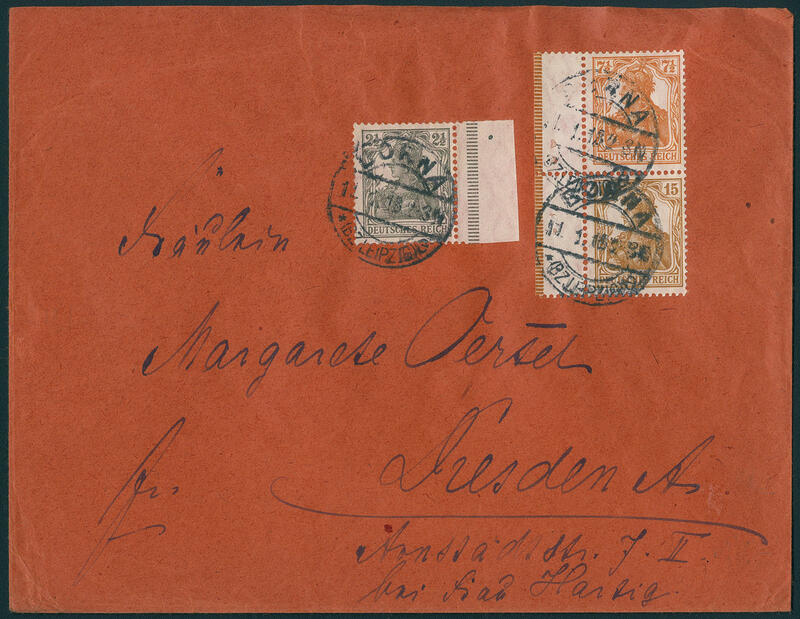 Rarest tête-bêche se-tenant, fresh colors and very well perforated, in the gutter as usual folded, with two nice mounted clearly special cancellations \"RONSAHL climatic health resort 28.1.29. \". Very decorative and extremely scarce unit! Photo expertize Dr. Oechsner BPP. Michel 6000,- €. 4990 ✉ KZ14 Help in need 1929, 5 Pfg. Use welfare stamps Z use welfare postcard - 5 Pfg. - 5 Pfg., the scarce horizontal tête-bêche gutter twice se-tenant with additional franking 8 Pfg. Ebert with good lying watermark (Michel no. 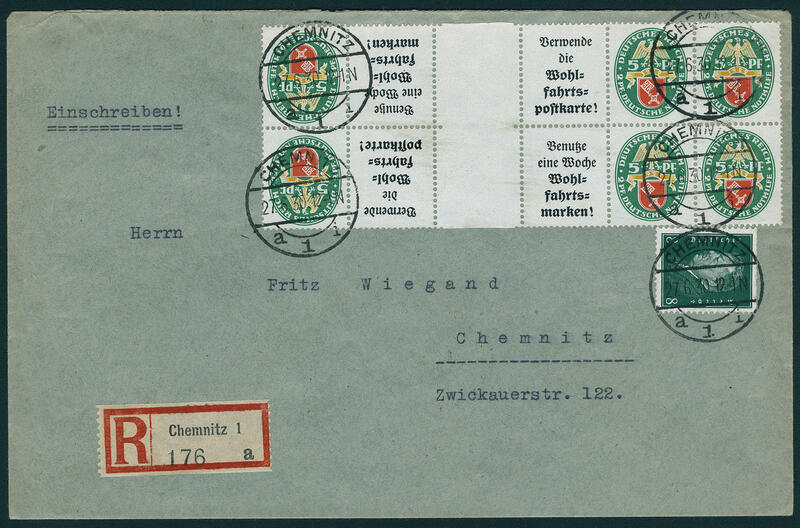 412 Y), in perfect condition on very nice, correctly franked registered cover from \"CHEMNITZ 27.6.30. \" in the local usage used with arrival postmark of an others post office. Michel for the se-tenants 2100,- €, the scarce 8 Pfg. Ebert is in the Michel catalogue due to missing offers only noted without price! Photo expertize Hans-Dieter Schlegel BPP. 4991 ✉ KZ16 Help in need 1929, 8 Pfg. 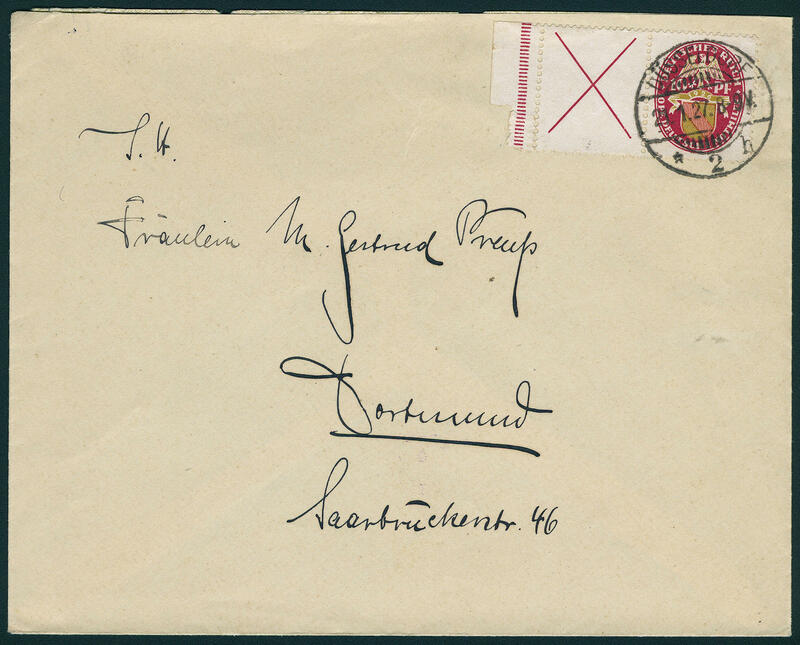 ZX15 Pfg., the scarce tête-bêche gutter twice inside one unit from lower margin on decorative, nearly correctly franked registered cover from \"COTTBUS 17.3.30\" to Berlin Wilmersdorf. An unusual decorative se-tenant rarity! 4973 ✉ S7 7 ½ Pfg. 15 Pfg. 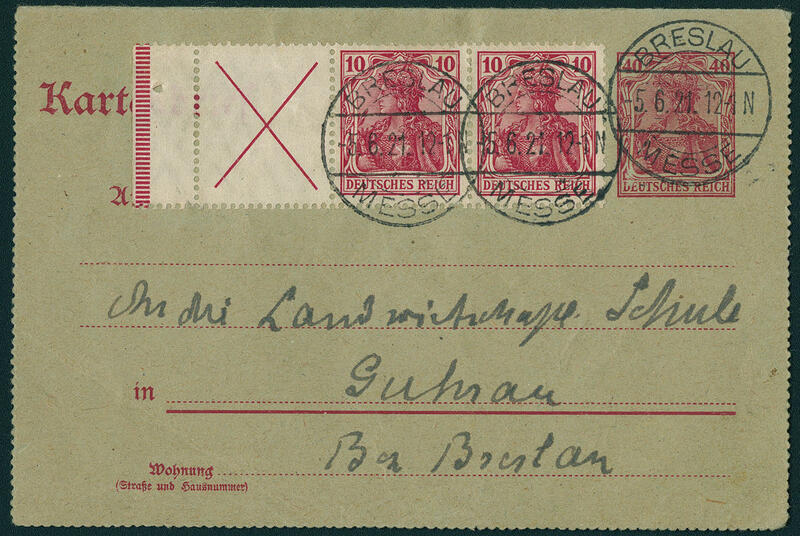 Germania, vertical se-tenant from left margin of sheet (perforations going through margins), with additional franking 2 ½ Pfg., in perfect condition on correctly franked cover from \"BORNA\" in the 2. Weight step to Dresden. Rare! 4974 S37 8 Pfg. Hindenburg St. Andrews cross, vertical se-tenant, fresh colors and very well perforated, in perfect condition mint never hinged without any signs. Michel 200,- €. 4975 S38/41 4 Pfg. Presidents of the Reich, all fours vertical se-tenants with St. Andrews crosses, fresh colors and very well perforated, in perfect condition mint never hinged without any signs. Michel 580,- €. 4976 ⊙ S61 Help in need 1928, used the welfare postcard - 8 Pfg. - used the welfare postcard, the scarce vertical se-tenant, wonderful fresh colors and in perfect condition perforated, especially nice centric and neat cancelled \"BERLIN 15.2.29. \". An exception copy this se-tenant rarity for the highest standards! Photo expertize \"perfectly quality\" Dr. Oechsner BPP. 4977 S66 Help in need 1928, use the welfare postcard 8 Pfg. St. Andrews cross, vertical se-tenant, from lower margin, fresh colors and very well perforated, in perfect condition mint never hinged, without any signs. Very rare! Michel 3000,- €. 4978 S73 Help in need 1929, 8 Pfg. St. Andrews cross 8 Pfg., vertical se-tenant, fresh colors and very well perforated, in perfect condition mint never hinged, without any signs. Michel 350,- €. 4979 S98 Help in need 1931, 15 Pfg. Use the welfare postcard, vertical se-tenant, fresh colors and very well perforated, in perfect condition mint never hinged without any signs. Michel 320,- €. 4980 ✉ S111,S113 Hindenburg watermark waffle, 12-8-12 Pfg. 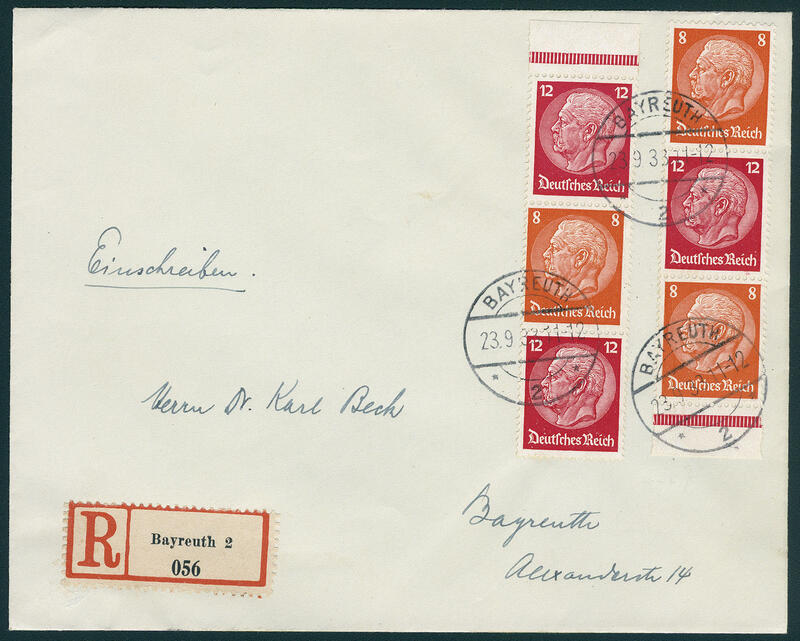 And 8-12-8 Pfg., two good vertical se-tenants from margin of sheet, in perfect condition on philatelic local registered cover from \"BAYREUTH 23.9.33. \". Michel for single used already 240,- €. 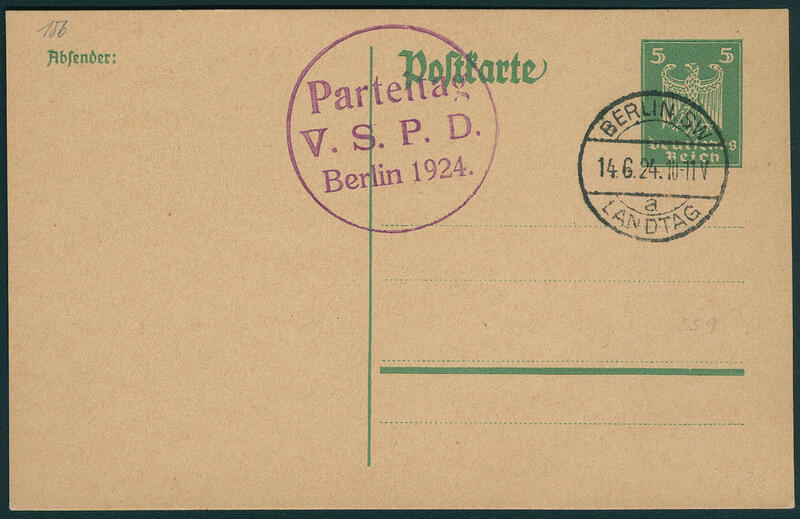 5010 ✉ \"party congress V. S. P. D. BERLIN 1924\", violet single circle postmark on postal stationery 5 Pfg. With two ring cancel \"BERLIN State Parliament 14.6.24. \". It is a matter herewith about the United social democratic faction Germany's. Rare! 5011 ✉ Letter telegram your majesty of the Empress and Queen from the Exile in the Netherlands (house Doorn) from 17. 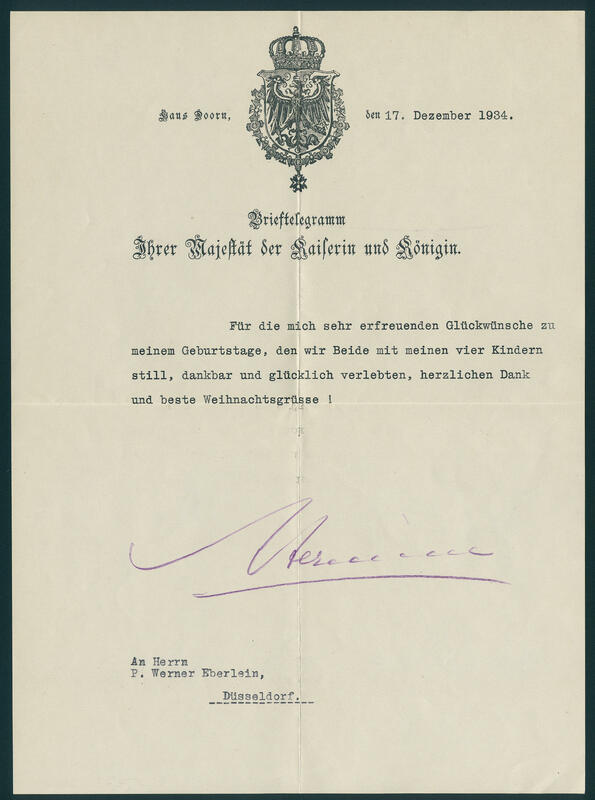 December 1934 to Düsseldorf. These thanks be for the Congratulations to their birthday. An extraordinary contemporary document.